In compiling this landmark sourcebook, Finnish guitarists Hannu Annala and Heiki Matlik consulted more than 70 music texts as well as dozens of composer resumes acquired from the musical information centers of several countries. During the writing process, which lasted for more than three years, they received additional information from many modern composers, including Leo Brouwer and Reginald Smith Brindle among others. In addition, several internationally renowned performing guitarists provided valuable information; these include Magnus Andersson (Sweden), Remi Boucher (Canada), Margarita Escarpa (Spain), Aleksander Frauchi (Russia) and David Tanenbaum (USA) among others. The authors’ aim was to write a well-structured book with separate chapters for each instrument, such as the Renaissance and Baroque guitar, the Renaissance and Baroque lute, the vihuela, etc. This unique structure enables the reader to easily discover which composers wrote for a certain instrument during any given period. In addition to the composers one would expect to find in such a comprehensive listing, the book documents several historical and modern composers for whom little previous information has been available. The book’s list of more than 400 guitar and lute concertos dating from the Baroque era to the present day is a totally unprecedented. Short introductions regarding guitar and lute-like instruments as well as their basic histories are provided at the beginning of the book. 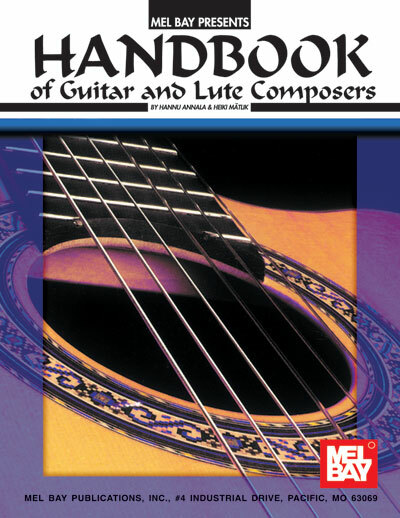 The authors hope that the Handbook of Guitar and Lute Composers will serve as a practical guide for both amateurs and professionals, encouraging further study of the history of these instruments and expanding the repertoire heard on today’s concert stage.